The Pink Diamond is the most precious of all fancy coloured diamonds. With a diminishing world supply of natural pink diamonds, they are becoming more precious still.The rarity of this colour of diamond makes it one of the most expensive colours types of diamond available. 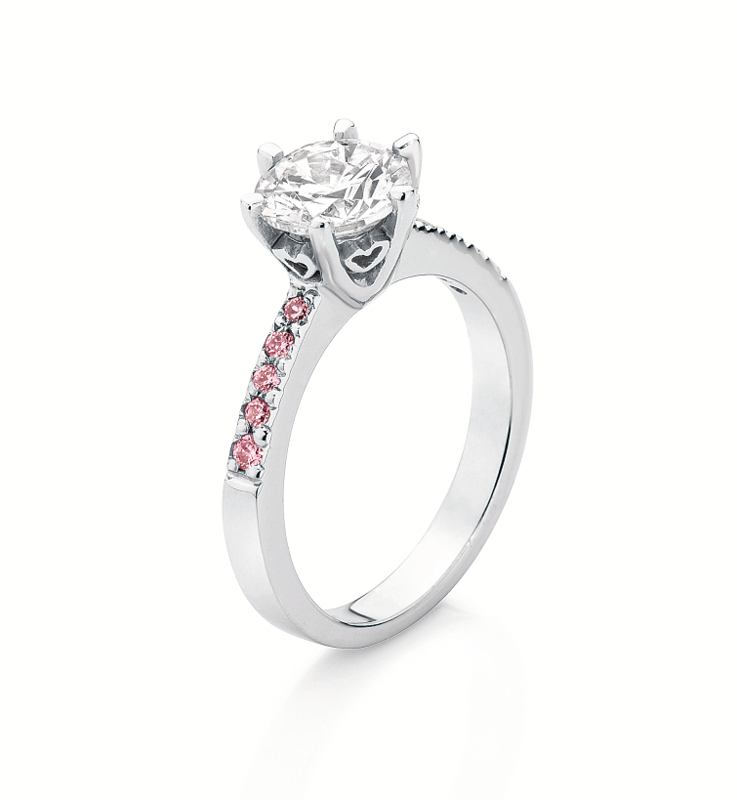 The Argyle Pink diamond has grown in status and popularity over the last twenty years. Originally the domain of royalty, increasing celebrity endorsement and media attention has increased the desire for pink diamonds. The 6.10ct pink diamond given to Jennifer Lopez by Ben Affleck in 2004 brought pink diamonds into the public eye, and demand has grown exponentially. Australia’s Argyle Diamond Mine, located in the Kimberley Region of Western Australia, is the world’s foremost supplier of pink diamonds, producing 95% of the world’s supply. To illustrate the rarity of these diamonds, for every one million carats of diamonds mined from the Argyle Mine, only one carat is gem quality pink diamond material. Experts are still unsure as to what causes the pink colour of these diamonds. Geologists have speculated that a deformation in the atomic structure of the Kimberley region and resulting mineral caused the formation of pink diamonds. The exact reason for their pink colour remains a mystery. Pink diamonds are graded on a different colour scale than any other colour of diamond. There are four main categories for pink diamonds, listed from the most to least common: pink champagne (PC), brownish pink (BP), pink (P) and purple pink (PP). Each of these is subdivided into colour variations based on the intensity of colour in the individual diamond. Brownish Pink, Pink and Purple Pink diamonds have colour scales that range from 8 to 1, with 1 being a diamond that displays the most intense colour within that range. Diamonds graded 1-3 are considered Vivid Pink, 3-5 Fancy Intense Pink, 5-6 Pink and 7-8 Light Pink. Pink Champagne diamonds are rated from 1PC to 3PC with 3PC being the most intense pink champagne colour. The same rule applies for pink diamonds as for all fancy coloured diamonds: the more intense the colour, the rarer and more valuable the diamond. When purchasing a pink diamond it is very important to choose a stone that is certified as a natural pink diamond. White or off-colour diamonds can be treated using various processes to create diamonds with a variety of colours, including pink. Jewellers are ethically bound to disclose these processes, including irradiation and High Pressure High Temperature (HPHT) treatment, to customers, however, some do not. Pink diamonds, despite the intensity of colour, typically cost up to twenty times the cost of white diamonds of a similar size. The larger the diamond, the rarer it is, and the more expensive it is. So, if you think that the price on a “natural” pink diamond is “too good to be true,” it probably is. If you do like the look of pink diamonds but your budget does not extend that far, treated pink diamonds are a suitable alternative. Off-colour white diamonds (lower colour graded diamonds) can be treated through the aforementioned processes to create pink coloured diamonds at a significantly lower price to that of natural pink diamonds. Pink sapphires, in their wide range of pink shades, are also an excellent alternative to natural pink diamonds.